I have always pictured Lily with blue eyes, just like her mama. Somehow in my mother heart, I have always felt this to be true. 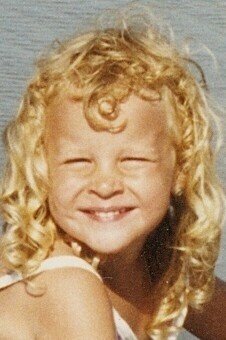 And curly blonde hair like I had as a little girl. Maybe it would have gotten darker as she got older, as mine did. When she was born, her face looked just like mine. Everyone else said so too. Her nose, a miniature version of mine. Her heart-shaped lips looked just like mine as a wee babe. Oh she was beautiful. Four months after Lily was born and died, I had a dream about her. We were at a party with a lot of other babies and there she was. All of a sudden, she had gotten so big and I remember feeling sad that I didn't have pictures of her when she was smaller. I immediately knew it was her, even though somehow I didn't feel like I knew her because I hadn't seen her for a while, yet deep down I did know her. She had on a shirt that said, "Ginny" (my moms name). Don't ask me why, but it made sense in my dream. She looked just like my mom as a baby, who looked just like me. She had curly, blonde hair and soft, blue eyes. I looked out of the enormous glass window at the beautiful scenery while she played with the other children. We were leaving, walking to the car. I felt the weight of her in my arms. She's getting so heavy. I look down at her little face, smooshed up against my chest, her floppy body fast asleep. She was so trusting. She knew I would take care of her and cause her no harm. I took her to the car and placed her in the driver's seat. Kneeling down next to her in the pebble driveway, I stroked my fingers through her soft hair and kissed her smooth, pale skin. I thought to myself, "I thought she was gone?" But, here she was in front of me. I just watched her sleep. I drank in her presence. She fell backwards across the seat and I went around to the other side of the car to pull her up. We drove along an old, rugged road, just me and her. There were no yellow lines winding along as we drove mile after mile, gazing at the lush, green meadows in the distance. She was asleep. I was driving. And things were okay. It was short, and was one of those dreams that truly feel like a dream because it was so peaceful and beautiful. You and I were just sitting in chairs next to each other in a living room somewhere. And Lily was there. I don't remember you or I saying a word to each other, we just smiled and laughed and watched Lily. She wasn't a baby, she actually looked like the just barely two year old that she should be. All I remember is that she had really sweet wispy blond hair, and gorgeous blue eyes. And I knew she was Lily; she truly did look just like a little mini you. It seemed so completely natural that she was there with you, as she would run playfully around the room, and then straight back to you again. She was absolutely beautiful, Hannah Rose, and she definitely knew that you were her mama. That was pretty much all, except that right before I woke up, she looked up at me and smiled, and from that moment I knew that I was supposed to remember this dream and share it with you. It made something I had remembered reading on your blog very real - that while she only got to be a little Lily-bud here, she is most definitely blooming with life in Jesus. That even when little hearts seem to stop on Earth, they never miss a beat in the Heavenly realm. What I feel most strongly when I think of it is that - Lily is alive. Vibrantly alive. And that you are mother to an adorable, blond-haired, blue-eyed, Lily, and little Luke too, and you always will be. Even though you're missing them now, Eternity awaits. There's that curly blonde hair again...and those beautiful blue eyes. There is something about her eyes that looks so wise…perhaps it's because she knows Heaven. I love the rose in her hair and how appropriate are the roses and lilies in her hands? 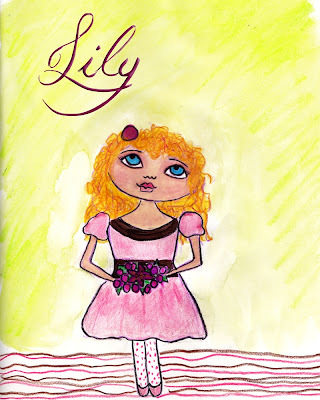 :) She's "my little flower," as I call her…my precious Lily girl. She looks so delicate and feminine, just as she did at birth. You could already see how feminine and beautiful she looked when I held her in my arms. I love her pink and brown dress because those are the two colors together that remind me of her. The dress is old-fashioned looking, which is perfect because I would have loved to dress Lily in such outfits...especially dresses like when I was little. And she had lots of polka-dots on her clothes and things. Here is a picture of me as a little girl...see the resemblance of how I looked and how Lily may look now? My eyes are squinting in the sun, but they are blue. I know Lily and Beth's daughter, Eve, who is also in Heaven, must be friends and sit on Jesus' lap together. Lord, thank You for giving me a glimpse of my blue-eyed daughter of Heaven...thank You for reminding me that though my sweet girl isn't blooming here, she is most assuredly blooming more there than she ever would have here...and my love for her only continues to bloom on earth and one day, we will be reunited forever and for always. "A tiny flower, lent not given, to bud on earth and bloom in Heaven..."
Because of how much I've been touched and blessed by this drawing, I wanted to share it with others. I know other babyloss parents may find comfort in such a keepsake as well. Beth, who runs Epiphany Art Studio, is now offering these beautiful, whimsical drawings for babyloss parents. However you imagine your child looking on earth or in Heaven, Beth can come up with a creative interpretation of it. You can request the hair color, type and length, eye color, clothing color, and background color. You will get a high-resolution image of your drawing emailed to you within a months time, all for a very affordable price. 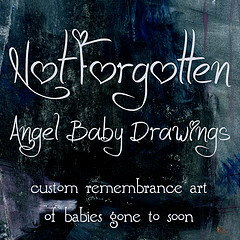 If you are interested in requesting your one-of-a-kind Custom Digital Remembrance Art For Babies Gone Too Soon - Made to Order, Miscarriage Stillbirth Babyloss - Not Forgotten Angel Baby Drawing, click here. Love the depiction of your sweet Lily here...and also the one with Beth's Eve. It's no accident, the souls that are knit together on this earth. In heaven, we will know as we are known. And, no doubt, our children already know one another, just as they will know us. And, they are blooming, dear friend. In the very best place there is. Love to you...looking forward to reading the words of your heart on the upcoming WWY. Lily is so beautiful! It's incredible how she finds a way to be a part of your life. She's everywhere. You're surrounded with her love. This was such a phenomenal post to read. Thank you for sharing it!